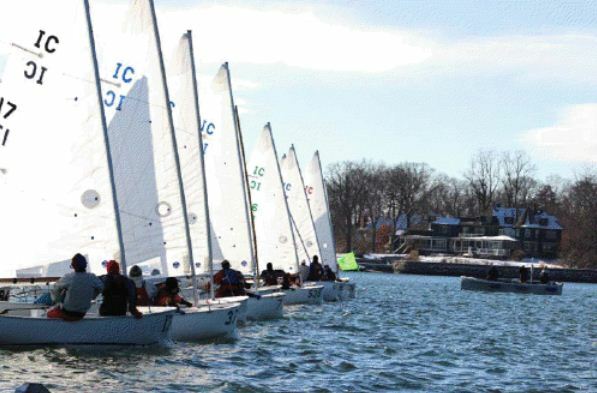 Despite freezing temperatures all weekend, with wind chills in the low teens on Saturday, 26 teams braved the 2013 Interclub Midwinter Championship at Larchmont YC. The 104 sailors (52 skippers, 52 crews) arrived on Saturday to find snow on the ground, ice in some boats and temperatures in the low 20s. After deploying rock salt, heat guns and boiling water to free stuck lines and centerboards, teams were able to hit the water and get in four races per division, despite salty icicles that began forming on bow covers, mast partners and turning marks. The Interclub Midwinters features “college-style” racing — competitors team with friends to form “A” and “B” teams, with the lowest combined score winning the regatta. Each race is 10-15 minutes in length and there are no discards, placing a premium on consistency and short course strategy. Sailors rotated divisions every two races on Saturday to keep warm, and when the mercury inched above 32 degrees on Sunday, the race committee was able to get in a three-race set along with an additional two-race series to allow for a total of nine races per division. Large helpings of clam chowder and hot chocolate kept competitors warm in between races. Northerlies both days caused shifty winds but were strong enough to allow for minimal delays and the sunny skies and racing close to shore allowed for brisk rotations. Reigning IC Midwinter champions John and Molly Baxter, Danny Pletsch and Emily Anderson dominated the weekend, never finishing a race outside of the top six overall to win the overall title by 56 points over Clay Bischoff, Kendra Emhiser, Ted Ferrarone and Meredith Killion. David Dowd, Maeve Judge, Ben Cesare and Coco Sprague finished third overall despite missing the podium in both A and B fleets. The Midwinters counts toward the Wharf Rat Challenge, a trophy donated by Steve and Heidi Benjamin for overall performance during the winter IC circuit. The next Wharf Rat event is the Stanley Bell Memorial at Larchmont March 9-10, followed by the Tally Cup at Cottage Park YC (Winthrop, Mass.) in late March, culminating with the nationals April 13-14 at Severn Sailing Association in Annapolis.